ENGINE HP 13.5, Height: 7ft. 7 in. The ViO17-A goes almost anywhere and works efficiently in tight, narrow areas. Our most compact zero tail swing mini excavator goes where larger excavators can t, and works easily against walls or buildings. But its small stature doesn t sacrifice power. The 14.5-hp final Tier 4 diesel engine provides the power you need for the toughest jobs, with dramatic lifting capacity and bucket digging force that belies it s size. 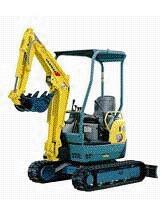 Plus YANMAR s unique, sturdy variable undercarriage provides flexibility, stability and safety. * Please call us with any questions about our backhoe mini track yanmar 16 foot rentals in Tulsa OK and neighboring communities in Northeastern Oklahoma.